Overseeded with perennial rye for winter color. NORTHERN CALIFORNIA'S CHOICE FOR PROFESSIONAL SPORTS FIELDS, LANDSCAPES, PARKS, PLAYGROUNDS, AND GOLF COURSE TEES, FAIRWAYS, and ROUGHS. Currently overseeded with rye for winter green! West Coast Turf's Tifway II bermuda has the shortest winter dormancy of all hybrid bermudas, and is able to stay green longer into the Fall, and greens up earlier in the Spring. With its great durability, beautiful dark-green color, and recuperative abilities, Tifway II is a top performer on golf courses and sports fields, and is the best bermudagrass for coastal areas of California. 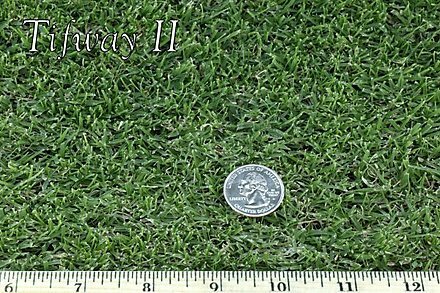 Like all our hybrid bermudas, Tifway II is a drought tolerant grass, and requires very little water compared to cool season grasses like fescue. Medium-fine, slightly coarser than Tifway 419. Top ranked in overall quality studies of bermudagrass cultivars conducted by the National Turfgrass Evaluation Program. Resistant to sting, root knot, and ring nematodes. Shortest dormancy period of all bermudas. Recovers quickly from injury with vigorous, dense growth habit. Tolerant of heat, poor water quality, heavy foot traffic, and drought. Stiff leaf blades creates excellent lie for golf balls. Thrives in warm to hot climates USDA zones 7-11. Not shade tolerant. Requires full sun. Overseeded sod: Perfect for fall season installation.